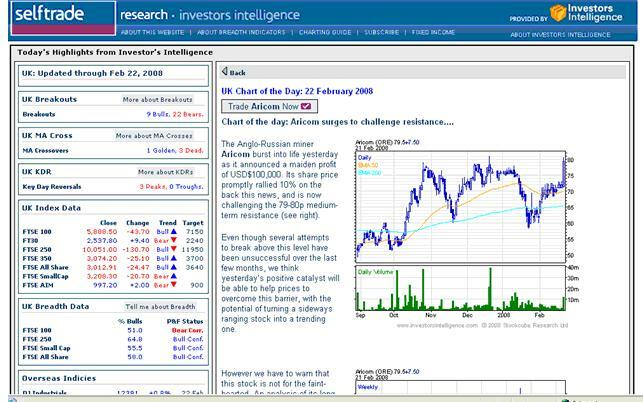 In addition to the thousands of individual subscribers across the world who rely on Investors Intelligence for technical and sentiment analysis, II provides a number of leading brokers, financial institutions and media providers with content including value added data and editorial content from our analysts. Available by email, or integrated into client websites, II's white label and "microsite" analysis tools provide the best in independent research. In the US our technical analysis filters and index breadth studies are supplied to the Wall Street Journal. Other organizations utilizing II's specialist indicators include Thompson Reuters & the research departments of several leading investment banks. UK and European Customers include Selftrade (see example, right) and ADM Securities. To chat about your requirements, or for more information, contact Scott Gale on 00 44 (0)20 7352 4001 or drop him a line on sgale@stockcube.com.